This one is a pretty sad quote really. Don’t you think my Pandas? But it’s a quote I can relate to so vehemently that it brings a slight glistening of wetness to my eyeball. It’s just so sad. How can you spend years with someone and then end up being strangers? Someone who once knew what the other’s most precious secrets were. Who knew you down to your very soul. Most of my ex’s, funnily enough, I happen to still be friends with. I think that says something about me in relation to this quote. It’s like I don’t want to lose that connection with someone who once used to share my bed. Because, simply put, they are the ones who knew me the best. Who saw all my flaws and loved me even still. They knew me better than my closest girlfriends. And I suppose I didn’t want to lose that part of me. I want that reminder of how I was as a person. For with each one I evolved into something else. And as the years went on, I moulded into the lady I am today. Partly, because of the men in my life. There is one however that I simply can’t be friends with. He hurt me more than I would like to admit or share for that matter. It was a very raw existence where I was an unknown player in an unsolvable game. Yet we have over a year and a half worth of memories between us, binding us. Some were great and others were terrible. We saw each other almost every day in that time frame. You can know a lot about a person if you are with them every single day. You learn things quick. This person now, however, is an unknown soul to me. In my mind he’s floating around aimlessly. Yet I can’t seem to shake the memories away. I wonder sometimes what would happen if we were ever to glance upon the surfaces of our face again. To stare at each other intricately. Even though time and distance grew. I think I might have shed a few tears. Yet despite feeling that, sometimes, there are days where I forget about him completely, almost like it was me, and not Kate Winslet who erased her memory in Eternal Sunshine of The Spotless Mind. And then, something out of the blue will jog my memory and suddenly a little glimpse of a smile or the cheekiness in his eyes will remind me that I once had something with this person. That WE, once had something. 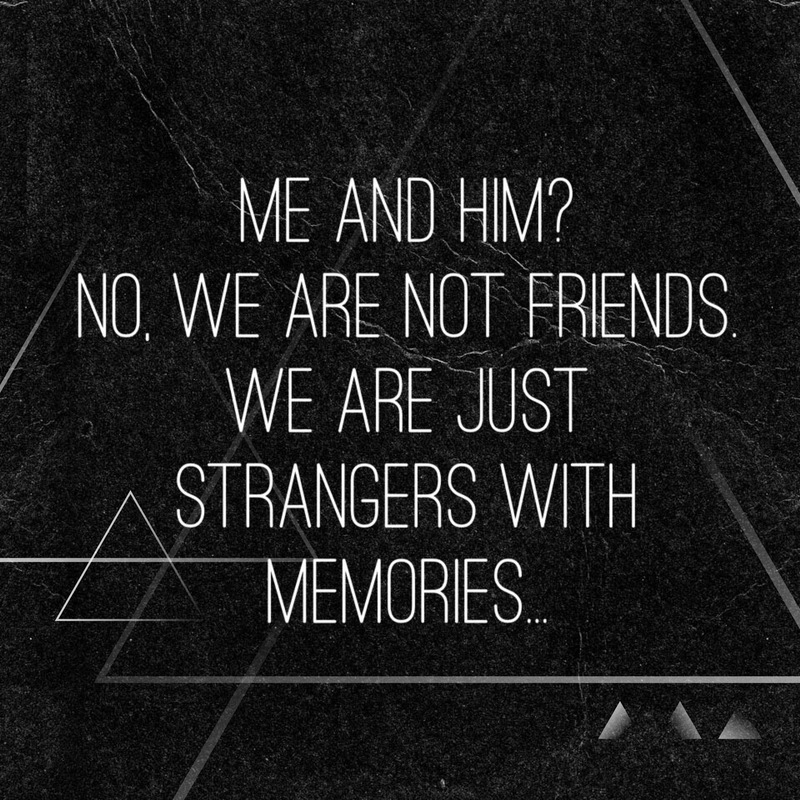 In the end, we definitely did become strangers with memories.